Assorted Notions: How much cuteness can fit into one store? How much cuteness can fit into one store? Edited 6/6/07 to try to make the second photo enlargeable, but was unsuccessful. I'm putting "Learn HTML" on my to-do list. 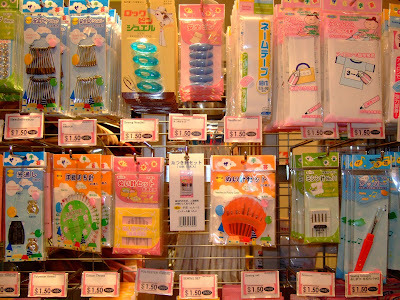 3) everything is adorable in that way that only Japanese products can be. 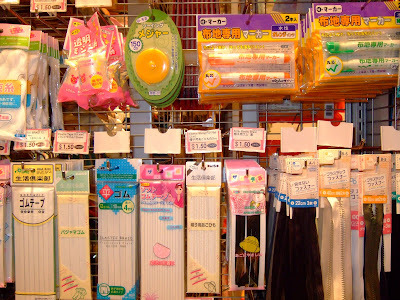 From kitchen gadgets, laundry organizers & stationery to aprons, pet toys & toiletry travel bags, Daiso has got you covered. Seriously, I can't even begin to describe their selection, you've just got to see it. The first time I went, I was there for 2 hours taking it all in. Yesterday I noticed an endcap of sewing notions. They've got elastic, safety pins, crochet thread, measuring tapes, etc. There was a little set of machine needles, but I wasn't sure if they would fit my Pfaff. They even have invisible and regular zippers, in sets of 3 short or 2 long, and yes, they are only $1.50. Okay, I'm not sure of the quality, but I'm willing to do a little research to find out. And it sure beats schlepping into Joann. Ack! Ack! My greatest regret is not getting to Japan while my parents still lived there. That is so stinking adorable. Thanks for the pictures! I've been putting off a visit to that store. (Is it also the same store inside Alderwood Mall? I haven't been there in a while.) Now that I know they have cheap sewing supplies, I better go. I bet those needles will fit a Brother or a Juki. Geek Sewing - You should head over there soon, you would love it. It is the same as the one in Alderwood mall (but I've never been to that one). I'm looking forward to an upcoming blog post from you reviewing your new Daiso notions! Man, I made my first visit to Alderwood Mall in more than five years and didn't see this place?! Gah. Thanks so much for your suggestion re: Barcelona. We *are* staying there for the largest portion of our trip. I forwarded your link to the bf and will let you know what we decide. Also, how did I not know about your cute blog until now?